Located just a one minute walk from Chalk Farm underground station this flat is ideal for exploring Camden and all that London has to offer. It is close to Roundhouse and Hampstead Theatre and is perfect for couples, individuals, and business travellers visiting London. 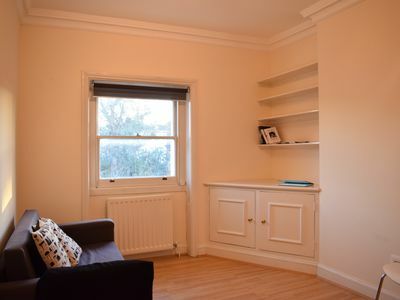 The apartment offers one double bedroom with plenty of wardrobe space, as well as an extra sofa bed in the living room. The kitchen is small yet modern with gas hob, oven and washing machine, as well as the cooking utensils needed to have a pleasant stay. Just off from the hallway is the shower room with a nice hot power shower to make those early mornings more enjoyable.